From left: Star Media Group Executive Editor, Mr. Brian Martin; 7-Eleven Malaysia Deputy CEO, Mr. Hishammudin Hasan; and 4As Council Member, Mr. Khaidi Kamaruddin. Kuala Lumpur, 2 November 2017 – 7-Eleven Malaysia, the leading standalone convenience store chain in the country, celebrates its third consecutive win in the Putra Brand Awards’ Retail category during the awards dinner ceremony held in the Grand Ballroom, Majestic Hotel, Kuala Lumpur. The attainment of the award marks yet another achievement for 7-Eleven as it represents the acknowledgement for brand excellence in the country from the consumers. Organised by the Association of Accredited Advertising Agents Malaysia (4As), the Putra Brand Awards is one of the highest regarded recognition for brand excellence in Malaysia, where the nation’s preferred brands are decided by Malaysian consumers and the winners are awarded a Gold, Silver and/or Bronze in various categories. 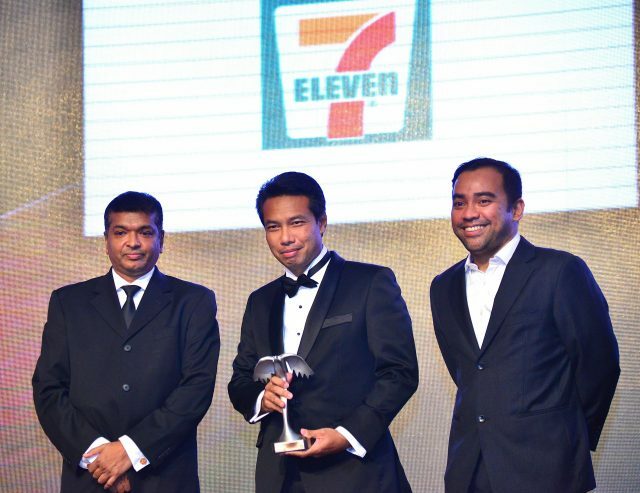 7-Eleven Malaysia is the pioneer and the largest standalone 24-hours convenience store operator in the country with over 2,200 outlets nationwide. For more information, please log on to www.7eleven.com.my or follow 7ElevenMalaysia on Facebook, Instagram and Twitter. Previous articleShocking Sales 11.11! RM1 and RM11 deals with FREE SHIPPING!